Nine months ago Nick Clegg vowed to remove government special advisers' salaries from the taxpayers burden. He is now spending £165,000 on his two spads. Just nine months after Nick Clegg vowed to remove government special advisers’ salaries from the taxpayers burden, the Cabinet Office yesterday revealed that Deputy Prime Minister Nick Clegg is charging the taxpayer £165,000 for press spokeswoman Lena Pietsch and political adviser Richard Reeves. At the time, the Liberal Democrats estimated that taxpayer savings would amount to some £5.9 million. Any coalition would have required necessary compromises between the two parties, but a point of political principle such as not charging taxpayers for special advisers’ salaries was within the gift of the Liberal Democrats alone. This could and should have been maintained even as the the Lib Dems went from opposition to government. The short term expediency of ditching a campaign pledge for the trappings of office is precisely the kind of matter that the Lib Dems would once have rightly hounded government ministers on. Give the bloke a Chance he went from being a nobody in charge of the liberals to deputy leader of the Tories, if we have no hung Parliaments in the future i suspect Clegg will join or try to join the Tory Party saying I’ve tasted power now, I love it I must go for it, I cannot stand being a nobody. Who can blame him Prescott had the same problems. Marcus, that was how this Con Dem Nation was put together. Mr.Sensible – Regardless of how this coalition was put together they still command a higher percentage of the UK electorate than any Labour government ever had. Why are you complaining anyway? Not one person elected that last useless idiot Gordon Brown as Prime Minister. What’s the problem? Nick Clegg is a Tory! Surely, his administrative costs should be borne by either the government or the Tory party! The difference is that the Labour party manifesto was carried out 90% whereas the Liberal Democrats have ditched 90% of their manifesto the day Nick Clegg capitulated to his fellow public schoolboy! Command a higher percentage of votes than Labour ever did? If the Conservative party could have won more votes than Labour in 1997 and 2001 they would have done so. If the Liberal Democrats had told voters they were going to ditch 90% of their manifesto to join the Tories they would not have received a fraction of the votes they did! Anon E Mouse – oh, so that’s ok then. People elected him, so he can blithely go back on the promises he made when trying to get elected. Newsflash – you can stop going on about Gordon Brown now, the election campaign is over. You Tory trolls have the government you wanted, ok? And, Mr Mouse, as I have said before, if the Lib Dems had got together with Labour we could say that about them. And as for all this about ‘no one elected Brown’, this is not a presidencial system of government. Which is why I am pleased the coalition ditched the rediculous Tory idea of forcing an election 6 months after a change of leader. Lets put it another way I’m sure the Tories will win the next election hands down, or even if labour wins it back either way, it’s going to be a very long time before the Liberals will be the party they thought they were. Thank god I only thought about joining them. Have to agree there, Robert. 1 thing I do fear for at the next election, though, is the possible turnout in some of those Lib-Con marginals given what’s happened. Nicholas Alcock – “Labour implemented 90% of it’s manifesto”. Sounds good but I really don’t know where that came from. Lords reform, tuition fees, Lisbon Treaty, 10p tax, child poverty? (To name but a few). 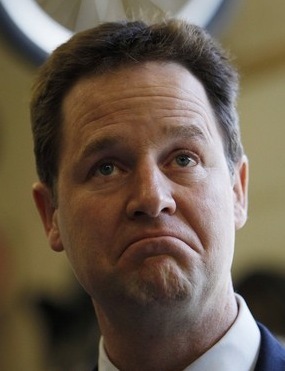 Oh they gave us the bin tax, HIP’s and ID cards – all now gone mercifully thanks to Nick Clegg (I don’t like Cameron!). Danivon – The government is a coalition – you need to look at other coalitions and the deals each have to do to reach agreement – your point is senseless and smacks of sour grapes. If (as I assume you are) a supporter of Labour really supported the party you’d be as horrified at the control freak way Gordon Brown was forced on the British people. You wouldn’t be shuffling along like some drooling Labour zombie, never daring to complain about the way a perfectly decent political party was hijacked by Brown and his bullying cronies. Perhaps if a few more people on this blog had actually been in touch with the views of the British people (and listened to people like me) Labour may still be in power with David Miliband as leader – and before you all start remember Blair said he’d serve a “Full Third Term” so party politics went out of the window. Mr.Sensible – Note the above remark please – I voted for Blair at the last election, not Brown – no one ever voted for that election losing idiot. Also you keep saying that Labour and the Lib-Dems would command an even larger majority but so what? They are not in government and the Tories and Lib-Dems are. The fact is, judging by the responses here the Labour Party REALLY has a long way to go to even be considered for office again. When one looks at the difference between Cameron and Brown at PMQ’s you can see just how bad Brown was. Newsflash Danivon – Labour lost the election. Get over it. RT @leftfootfwd: Special expediency http://bit.ly/b3ikou <<< hypocrisy once again..
Clegg would change the rules if he could, and probably introduce public funding of parties, but it would be silly to expect him to put himself at a disadvantage by doing so unilaterally, when, for instance the Tories won’t, and labour are getting Short money.